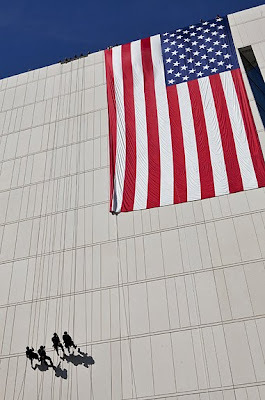 A giant American flag was hung backwards from the new Police Administration Building during it's opening ceremony last Saturday. American flag etiquette calls for the field of stars to the left of anyone looking at the flag from the street. The flag was hung with the star field placed to the right. Apparently the only people who knew this were the readers of the LA Times. Many complained to the editor of the Times, claiming possibly the paper printed it's Sundays front page photo in reverse. During opening ceremonies, I spotted a senior LAPD color guard officer catching an almost worse mistake at the last minute. Someone mounted the American flag, that was to be hoisted in front of the Chief and other city officials, upside down. 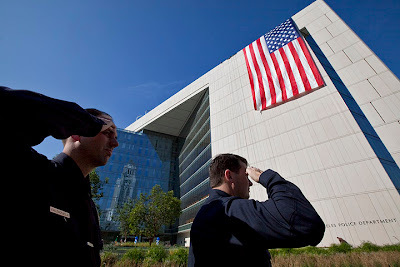 Oddly he didn't catch the breach of flag etiquette from the much larger flag, which was draped from the building by LAPD's swat team. LAPD officials issued an apology and promised to be more careful next time.